U.S. Rep. Jan Schakowsky (D-Ill.) speaks at an interfaith rally on Sunday. The event encouraged solidarity in the face of discrimination and prejudice. Local religious leaders held a rally at Lake Street Church on Sunday to encourage solidarity one year after the election of President Donald Trump. U.S. Rep. Jan Schakowsky (D-Ill.), Mayor Steve Hagerty, Evanston Police Chief Richard Eddington as well as religious and school community officials spoke at the event hosted by Evanston4All. The interfaith group formed after last year’s election to oppose intolerance and hatred. 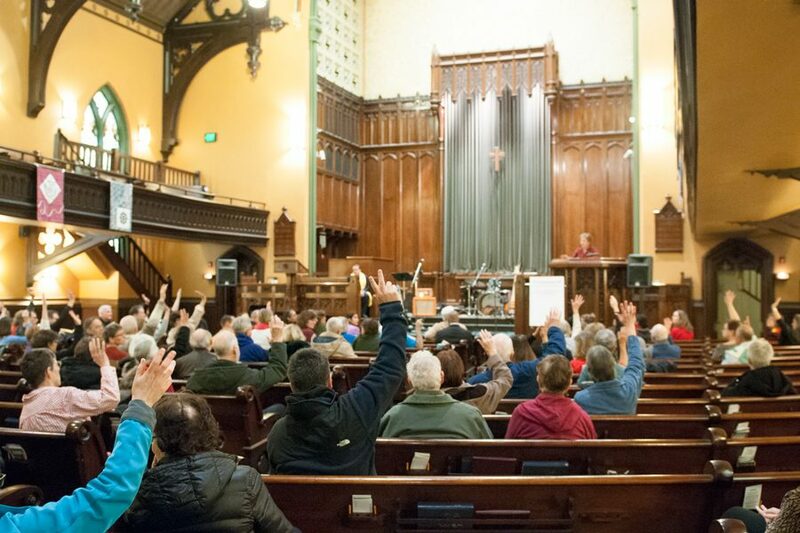 The rally — attended by about 100 people — was held to celebrate Evanston4All’s accomplishments, including the formation of “teams” that support and protect individuals targeted by discrimination, Rev. Ann Rosewall of the First Congregational Church of Evanston told The Daily. Organizers also encouraged faith communities to sign a resolution pledging to function as sanctuary communities, she said. Rosewall stressed that “sanctuary” is not just a physical location and involves many forms of advocacy. The sanctuary resolution is being circulated among various local faith communities, Abigail Backer, director of youth programs at Beth Emet Synagogue, said. It includes 13 actions communities can take, like educating on immigration and accompanying immigrants to deportation hearings. Backer said religious leaders are also calling for a “clean” DREAM Act — which grants residency to some immigrants brought to the U.S. as children — that excludes increased funding for border walls or interior enforcement. Though the resolution may have started with faith communities, it is not limited to them, Rev. Bret Lortie of the Unitarian Church of Evanston told The Daily. Evanston4All encourages any organization to join, he said. At Sunday’s event, Hagerty said Evanston is a welcoming and inclusive place. In October, City Council formally amended Evanston’s “welcoming city” ordinance to include broader protections for undocumented residents. “We will never turn over an undocumented immigrant unless there has been a warrant that has been issued and signed by a judge,” Hagerty said. Schakowsky said the DREAM Act is a pressing issue because immigrants form part of the country’s identity. The U.S. has always been a sanctuary country, she said. She added that a “new class” of immigrants face deportation because the Trump administration recently ended their temporary protected status. Citizens are responsible for protecting immigrants in their own communities, Schakowsky said. “We are not going to vote on an end-of-the-year deal on anything if we don’t get a clean DREAM Act passed,” she said. Paul Dickerson, an Oak Park resident who attended the event, said it was important to remain unified, especially now. He said he thought the speakers shared the same sentiment.